This current design has the same great style as all previous 6UL's but features a flow formed outer rim barrel for a better strength to weight ratio and lower rotational moment. The entire wheel was redesignd from ground up to further enhance controlled dissipation of loads and increase fatigue life. Most sizes will see a 10-12% reduction in weight from the Gen 3 version. The Gen 4 can be quickly identified by lug holes that line up symetrically with the valve hole centerline. Previous generation had lug holes clocked about 60° from the valve hole centerline. For the generation III design, we increased the load capacity to 500kg and used the more stringent VIA test protocol. The wheels gained a few ounces and greater fatigue life. The Gen 3 can be identified by the VIA stamp near the valve hole. The Gen 1, 2 and 3 designs are all 100% compatible with each other and can be mixed on the same car. Color variations may occur between generations. 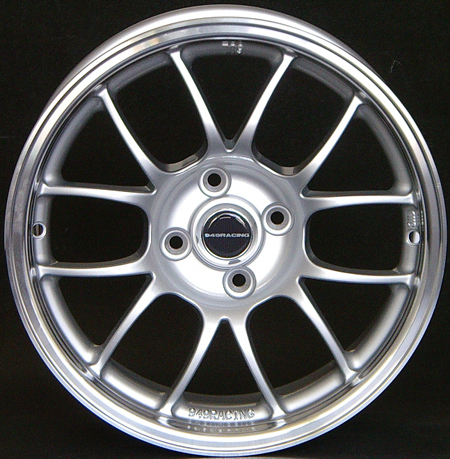 The second generation 6UL wheels are low pressure (LP) cast and T6 heat treated. LP casting refers to the aluminum being forced into the wheel mold under pressure. This pressure eliminates the possibility of bubbles and voids in the aluminum casting. It also compacts the aluminum which allows a higher tensile strength to be achieved with the same material. Gravity cast tooling requires larger wall thickness to allow the molten aluminum to flow into all the small features and crevices of the mold during filling. The design benefit of the new LP technique is that the engineers can optimize the thickness of each part of the wheel without really needing to allow for material flow. This optimization reduces weight without any decrease in strength. With a gravity cast wheel, the center hub area is the last part of the mold to be filled by the molten aluminum so it is more prone to unwanted porosity or voids. To combat this potential weakness, the hub area is overbuilt to ensure failsafe strength. With the new LP casting, the mold filling and density is the same throughout the wheel structure so the hub area can be further optimized and lightened. While we kept the same unique 6UL look, the engineers needed to create an entirely new engineering drawing and tooling for the LP casting process. We took this opportunity to reevaluate every single area of the wheel, perform further FEA optimization, strengthened and lightened wherever possible. It takes trained eye and both wheels in hand to spot the differences but there were more than a dozen little tweaks to the Gen II compared to the Gen I. The end result is a wheel that's about 5% lighter with nearly twice the fatigue life and substantial gains in strength. The Gen II also end up being a bit stiffer and that's directly creates more consistent contact patch loading. Few tuners ever think about this but a wheel that's too soft and flexible will actually deflect under hard cornering loads enough to reduce active camber. Stiff wheels are good. Gen 2s can be identified by the " 6UL " embossed right on the face of the wheel. The center bore on all versions is 67.1mm, which allows the optional use of standard size hub centric rings. The 6ULR is also be LP cast like the gen 2 6UL but features a flow formed, or spun forged, (also known as rotary forged) outer rim or bell. This is a one piece design. The still molten aluminum wheel with it's center section already shaped is then spun. The outer rim is rolled between a mandrel and inner wheel form to slowly drawn into the final shape. With roll forming, the outer rim is actually formed under extreme pressure so its a form of hot forging. This pressure further aligns the grain structure in the outer rim area which allows the absolute minimum possible material be used for a given strength target. The mandrels are CNC so an engineer can precisely vary the thickness to a few thousandths of an inch based on the results of FEA (Finite Element Analysis). 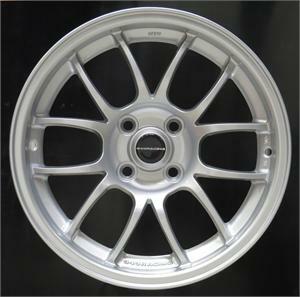 The first generation wheels were gravity cast and T4 solution heat treated. The center bore on all versions was 59.1mm, except the Spec Miata version which was 54.1mm hubcentric. The gravity cast 6UL's proved to have a great strength to weight ratio. Gen 1 6UL does not have 6UL cast into the face.